I have been teaching the cello for several decades and thoroughly enjoy the process of discovery that happens in a lesson. I teach all levels and to a wide range of ages, from children through adults. I believe that learning to play or improving one's playing can be a joyful experience and that mastery can be achieved at every step of the way. My goal as a cello and chamber music teacher is to impart the tools necessary for playing beautifully and naturally, with ease and confidence. Contact me for a free, 20 minute, introductory lesson. Fall Semester begins August 20th: Summer is a good time to try a few lessons before signing up for a Semester. 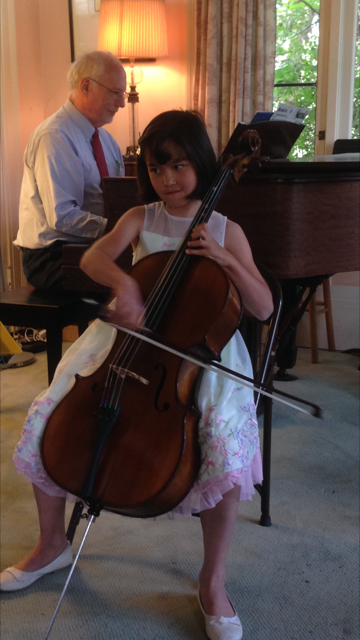 Private cello lessons are held weekly. *Average cost per lesson with semester discount plan. Daily practice (6 days a week) is essential: 15-20 minutes for beginners, 30--40 minutes for intermediate players, and 60+ minutes for advanced musicians. ASTACAP (American Strings Teacher Association Certification Achievement Programs): Participation requirement for all school- age students. Workshops and Recitals provide valuable performing opportunities. Cello Ensemble Gatherings hone essential skills for playing together. I have never drawn an artificial line between teaching and learning...to teach is to learn.